In 2011's masterful Drive, Ryan Gosling is a simmering incendiary device, steely cool on the exterior with a hellacious rage rumbling underneath his form-fitting, scorpion-adorned satin jacket. 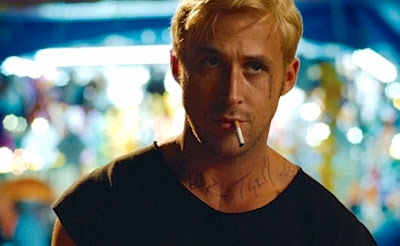 Gosling's edge isn't quite as cloaked in The Place Beyond the Pines. Littered with tats, whipping a switchblade around his six-pack abs with the skill of a street thug, the ex-Mouseketeer oozes intimidation as yet another stunt driver, Luke, a daredevil motorcyclist who makes his coin zipping around and around and around an oversized hamster ball at the local assembled-in-your-sleep carnival — a whopper of an opening shot. But Luke's life as the dreamiest, swollest carnie on the midway is tossed into a tumble cycle upon learning he fathered a child with a waitress (Eva Mendes) after his last trip through town. News of the progeny creates a monetary crisis for the Metallica fanatic, he wants to provide for his adorable male offspring, though the county fair circuit isn't going to cut it. Lucky for Luke, he happens upon a redneck while out for a joyride in the forest; said redneck (Ben Mendelsohn) experienced in ways of acquiring cash on the quick, AKA robbing banks. After some rudimentary planning, the duo begin knocking over financial institutions and the dirtbike getaways are things of kinetic beauty. Director Derek Cianfrance (who also directed Gosling in Blue Valentine) cranks up the shutter speed, tailing the bike as it tears through the mean streets of Schenectady. The small town setting, the solitude of upstate New York - captured magnificently by Cianfrance - gives it a fresh feel — the antithesis of the bourgeois big city chase. Getting more reckless - more daring - with each heist, Luke overplays his holdup hand and finds himself in the sights of a cop (Bradley Cooper) with bigger aspirations than simply sporting a badge. In the interest of non-spoilage, I'm choosing to end my synopsis there because at that moment The Place Beyond the Pines takes a radical turn. Without blowing the tire, let's just say the story is split in two — jarringly so. Adios momentum as The Place Beyond the Pines morphs into a glorified police procedural with - surprise - Ray Liotta showing up as the dirty detective. It's Cooper's piercing performance that keeps the second - and third - stanza afloat even as things run a minimum of 30 minutes too long and Cianfrance bombards you with dissolve transition after dissolve transition after dissolve transition. But while Cianfrance's overambitious narrative and Crash-y close come perilously close to bringing the film to its knees, the electrifying first half more than compensates. It's impossible to take your eyes off Gosling — until Cianfrance makes it impossible.